This is our flagship two bedroom unit with all the features you could wish for and more, with amazing views of the city. The apartment is 145m2 in size and has an open plan design that has large balconies on both sides of the building allowing for incredible views of the city. Miro 701 is our flagship two bedroom unit with all the features you could wish for and more. The apartment is 145 square meters in size and has an open plan design that has large balconies on both sides of the building allowing for incredible views of both the city and the mountains, as well as providing an outside area to socialize. Both bedrooms come equipped with queen sized beds, flat screen television, private bathroom, and tons of storage space. There is also a separate working area with a computer and bar. 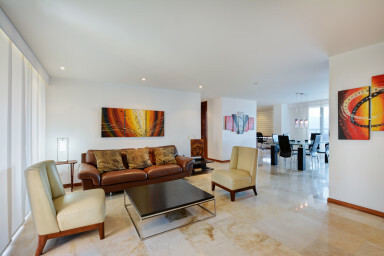 The furniture is of the highest quality and the polished marble floors and original art work are unique features not seen in many units. The building features a swimming pool, steam room, and parking; but perhaps the best feature is the location on the doorstep to El Tesoro Malls with its hundreds of shops, movie theaters, and restaurants, as well as the brand new mall 'Del Este' which contains, the best supermarket in the city, a fitness center, and a range of boutique eateries and stylish restaurants. The apartment can be cleaned on request for an additional cost..